Most kids with 1957 smart phone technology owned the Campbells brand made from empty tin cans connected with string. We punched a hole in the bottom of two cans, pushed the string through, and tied a big knot on the inside. Walk away then stretch the string tight to talk or listen. It worked up to 50 feet and no wifi required. Substitute a thin wire instead of the string and that engineering marvel was good for 100 feet, or more! We had fun. We laughed. Thinking back, we never imagined tap tap tapping Mom or Dad over dinner in morse code. Nowadays the majority of six year olds have a smart phone. I’ve seen 2 year olds navigating like a pro! Sad to say, but a new study confirms people suffer from separation anxiety if their phone is not within reach. 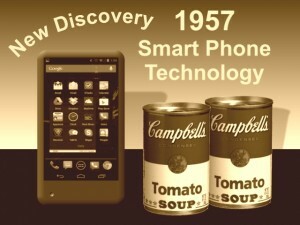 High tech devices get smaller, faster, and smarter every year, yet some of us still long for the good old days!